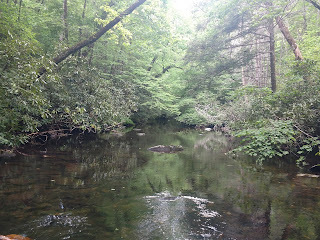 One of the things I would really like to do with this blog is to demystify fly fishing. 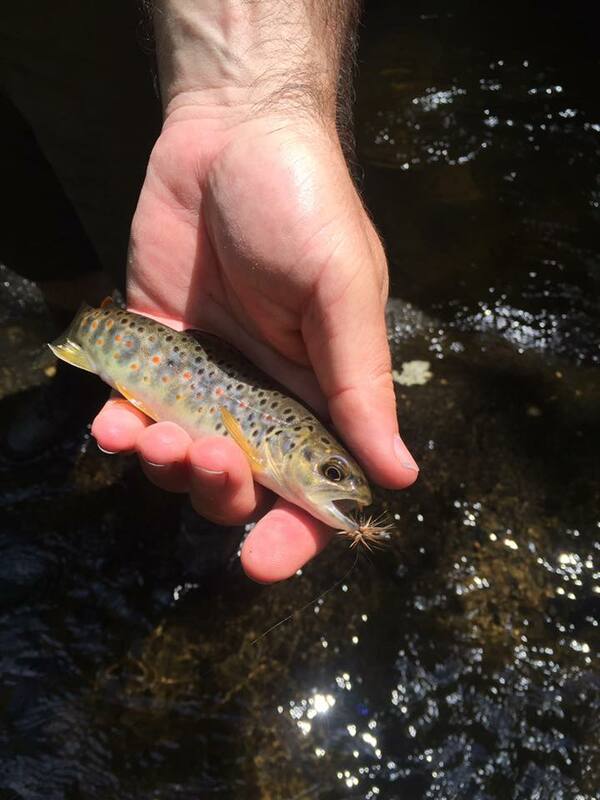 There is some sort of reputation or even stigma about fly fishing that it is an art form, takes years to master, is too expensive for common blue collar folks, blah, blah, blah. These myths are perpetuated by the media to a certain extent with movies like A River Runs Through It and Kiss the Water but the worst purveyors of this bull are fly fishermen themselves. Most people want to feel good about themselves and be a part of something they can identify with and I get that, but fly fishing and fly tying are really not that difficult. After all, you are trying to fool an animal with a brain the size of a pea that only thinks about eating and procreating, of course that describes most human beings as well. But really, tying a passable fly and flopping it out at realistic distances to catch fish is not hard at all. I'm not going to lie, the initial investment for all the gear needed to tie flies is not cheap, however, the first successful fly you tie you will start recouping your investment. I have not bought commercial flies in years and go through several dozen a year. 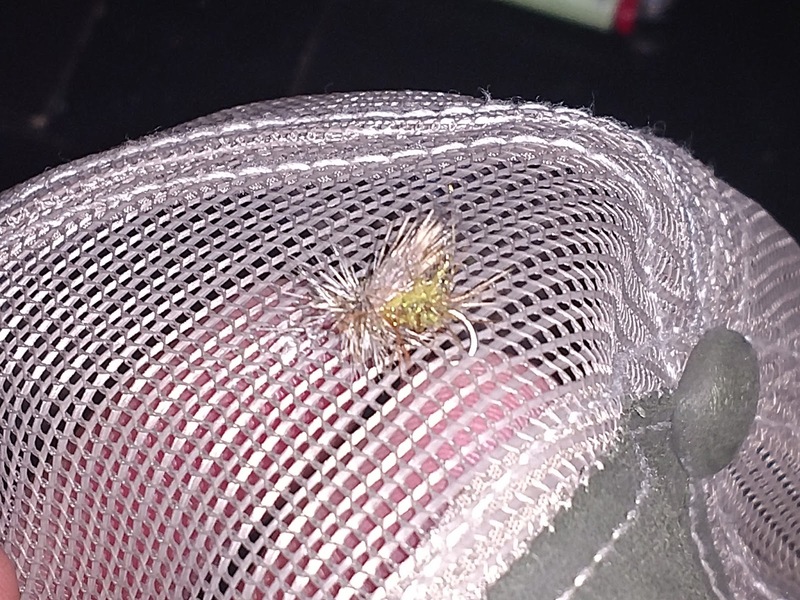 Tying your own flies is extremely rewarding. Catching fish on flies that you tied or maybe even a fly you invented is a great feeling. Although a truly new pattern is virtually impossible, somebody, somewhere has already tied it and caught fish with it but it is still fun to try. Commercial flies are expensive, about the cheapest you will find are around $1 a piece and it goes up from there, also my experience with commercial flies is that they tend to start falling apart very quickly. Tying my own flies would be worth it to me even without the cost benefit, just for durability alone. 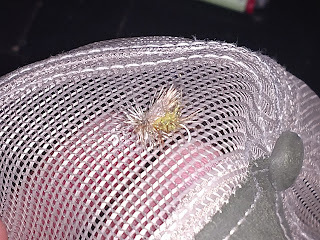 This is one of my flies that I fished one hell of a caddis hatch in Montana with. It has well into the double digits of fish caught with it and was still catching fish when I took it off. I have never had a commercial fly come close to that durability. Not the best pic in the world but I think you can see how well chewed that fly is. So what do you need to start tying flies? First and foremost you need a vise. The vise is what holds the hook so that you can tie on the fluffy bits. I am absolutely no expert on the latest and greatest, my vise is probably 80 years old and was handed down to me from the person that taught me to tie, my grandfather. It is a Thompson model A and you can find them on Ebay for $20 or less. I certainly am not saying that you need to use one of these antique vises, but I will say it seems to be perfectly capable and I refuse to get rid of it for sentimental reasons. I would love to know how many hundreds of pounds of fish have been caught with flies tied on that vise. New vises have lots of bells and whistles, such as rotating 360 degrees, which I can see as helpful but I just have not pulled the trigger on one. Besides the vise you need a few specialized tools. A pair of razor sharp, fine tipped scissors and a thread bobbin is probably all that is absolutely necessary for most patterns but a whip finisher and hair stacker comes in handy as well. Dr. Slick makes a very nice tool kit with everything you need in one package. It is not terribly expensive and the quality of the tools is actually very good. Do not let the surgical kit appearance intimidate you, I promise it is really not that hard and the tools are actually quite easy to use with just a little practice. You will also need the feathers and fur, thread and body material needed to make a fly. The rooster and hen necks used to tie most flies are not cheap, by a long shot. 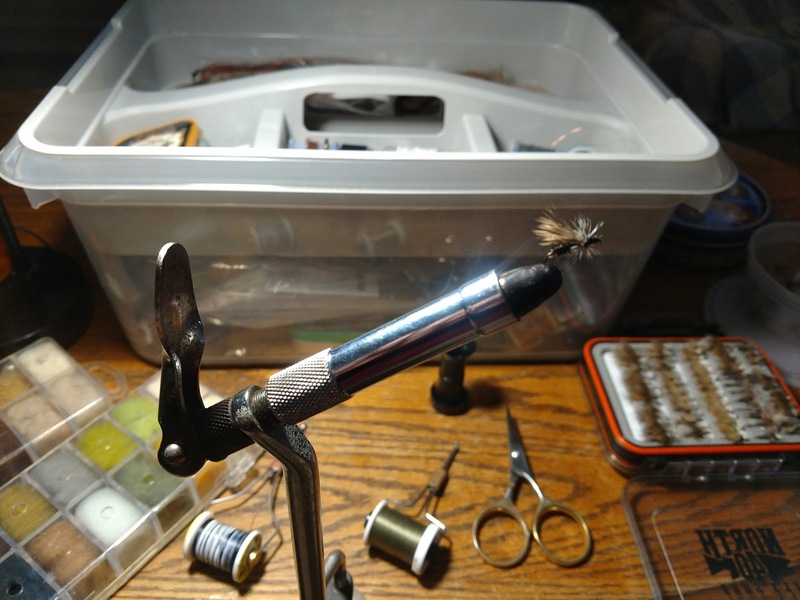 But when you are looking at them and the sticker shock hits you, remember that with each neck you will be able to tie hundreds of flies that last much longer than commercial flies. I use Metz grade #3 necks which are cheaper and still have great quality, I have been using the same necks for a over a year and they still have plenty of flies left in them. A great source of material is J. Stockard and FishUSA, there are lots more companies out there and you may be able to shop around and get lower prices. For making the bodies I use commercially made dubbing material, it is not expensive and a little goes a long way. A packet large enough to make 100s of flies is less than $15. I like the nymph material cause it is coarser and makes "buggier" looking flies in my opinion. To the right is a picture of a couple of the color necks I use most and some dubbing in a dispenser. Besides thread and hooks that is pretty much it. Your kit will grow in time as you tie more flies and different patterns but to tie basic patterns you don't need a room full of gear. The tupperware box in the picture of my vise holds all my gear and yes that is my living room coffee table, as I said you don't need an elaborate set up to tie usable flies. I hope you are not more intimidated than you were when you started reading this, believe me, if I can do it you can too. 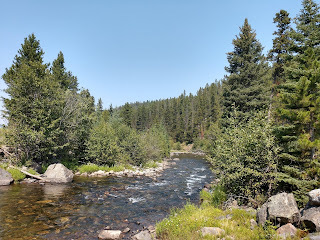 If there is a local fly fishing club near you, and I bet there is, they will usually have loaner material and are more than willing to help new fishermen and fly tiers. 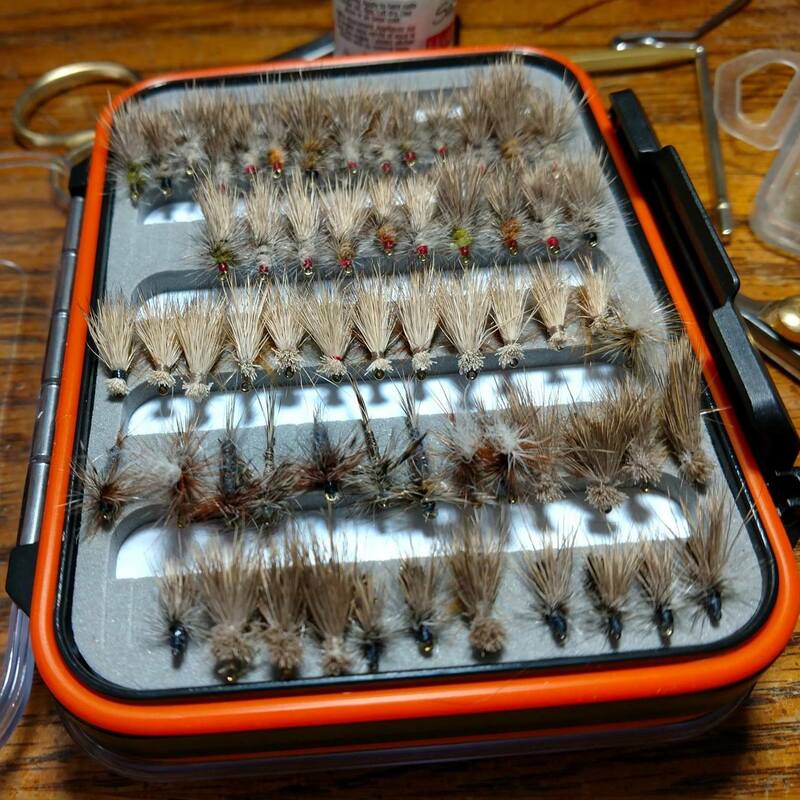 There are also some very good detailed Youtube videos explaining in depth how to tie different patterns of flies. 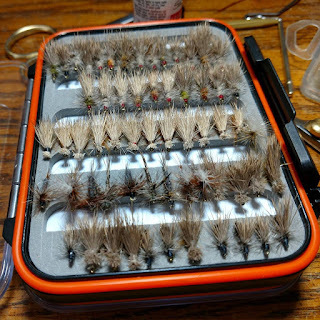 One of my favorites is Fly Fish Food, excellent tutorial videos. 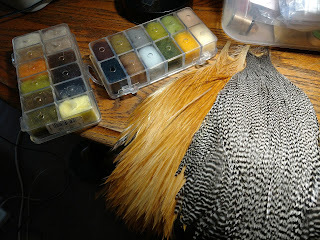 So if you have started fly fishing and are ready to take the next step of tying your own flies, go for it!